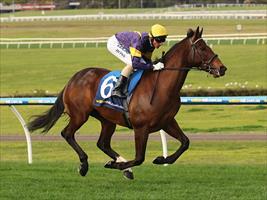 Three chances for a winner on Sunday including two at the metropolitan meeting at Caulfield. Falling Waters is the first to go in race three, the Sam Segman Handicap for three-year-olds over 1100m where she will be ridden by Patrick Moloney. The daughter of Turffontein raced on the speed to win her last start over 1000m at Yarra Valley on December 28. “She’s drawn out a bit in eight but it’s a straight run to one turn,” Mike Moroney said. “We’re anticipating more pressure in this race so we’ll just ride her where she’s happy but she has good gate speed so she could easily land in the first four or five. Lord Barrington runs in the last race of the day, the Jodie Taylor Handicap over 1100m and he too will be ridden by Patrick Moloney. The six-year-old was beaten less than a length and a half at his last start when sixth at Moonee Valley when carrying 59kg. “He’s struck a strong race but he’s down in weight,” Moroney said. “His draw suits him as he is a horse who can be a step slow before mustering speed. From where he is it is not as awkward as being on the inside. Araldo Junior (pictured) commences his campaign at Warrnambool where he is joint topweight in race six, the Koroit Cup over 1700m. Jordan Grob will reduce his weight to 58.5kg and Moroney said it is a good starting point for the import. “He’s in great order and a happy horse,” Moroney said. “He’s going well at home but he’s not won at this distance before.